Caps players modeled with canine-friends for a Capitals Canine Calendar that will benefit Homeward Trails Animal Rescue. See behind-the-scene photos and video from the shoot. That was the rallying cry earlier this year as the Washington Capitals battled their way to the 2018 Stanley Cup Championship, but it was more like ‘Go Dogs!’ at the MedStar Capitals Iceplex Saturday afternoon. That’s where the Caps, some furry fido friends and the Stanley Cup showed their modeling chops to benefit an animal rescue and adoption agency. Caps players modeled with canine-friends for a Capitals Canine Calendar that will benefit Homeward Trails Animal Rescue. 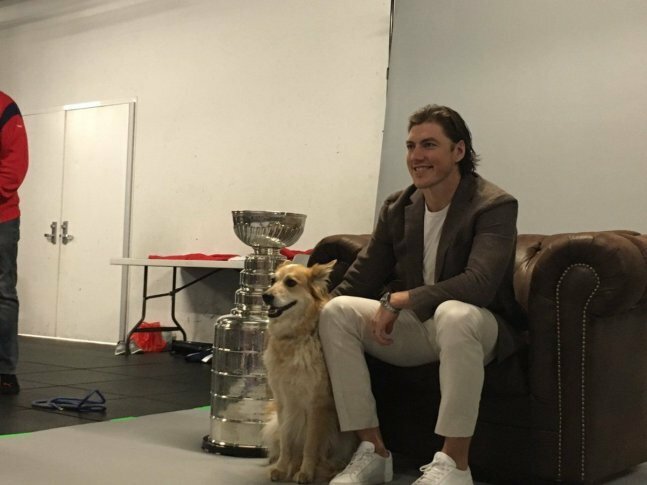 Doggie models included the pets of some Capitals players, as well as those being fostered by Homeward Trails Animal Rescue volunteers. Homeward Trails Animal Rescue facilitates pet adoptions in Virginia, Maryland, D.C. and beyond. They seek permanent homes for dogs and cats whose owners can’t care for them any longer. They also seek to find foster and permanent homes for pets from high kill shelters to spare them from being euthanized. Caps goalie Braden Holtby posed with one of the Homeward Trails dogs. He said participating in the calendar shoot to raise money to for the pet adoption organization is a meaningful cause to a lot of his teammates. “Some guys foster dogs … They’re great companions. They get people through a lot of things,” Holtby said. But what about his pet? “(I) have a tortoise, actually,” Holtby said. He said it’s new — not yet a year old. “[Homeward Trails Animal Rescue] bring dogs in from West Virginia; they bring dogs in from disaster areas like in the South. They’ve been bringing dogs in from North and South Carolina,” said Larry Milesk, a doggy foster dad who cares for a dog named Gizmo. Gizmo will meet his adoptive family on Tuesday. Other temporary doggy parents say they’re committed to caring for their fosters as long as necessary. The Capitals Canine Calendar is scheduled to hit the market right before Thanksgiving.